State Grid Corperation of China - Zhejiang Training Center, "Traning Program Development for Next-Generation Electric Power Grid", 2018/10 - 2018/12, PI, Grant No. K18-510102-028. Early Career Researcher Grant, Fundamental Research Funds for the Central Universities, "Electrical Utilization Safety Monitoring and Cloud-based Synthetic Awareness in Smart Buildings", 2018/01 - 2019/12, PI, Grant No. 2018QNA4018. NR Electric Co., Ltd., "Parameter Estimation Module Maintenance in Online Generation-Grid Co-Monitoring System", 2017/10 - 2018/12, PI, Grant No. K17-510102-032. National Key R&D Program, Ministry of Science and Technology of the People's Republic of China, "Stability Control in Bulk Renewable Generation System with HVDC Transmission", 2017/07 - 2020/12, co-PI, Grant No. 2017YFB0902005. Young Scientist Fund, National Natural Science Foundation of China (NSFC), "Stability-Constrained Power System Optimal Operation with Multiple Compound Uncertainties", 2017/01 - 2018/12, PI, Grant No. 51607155.
International Postdoctoral Exchange Fellowship, China Postdoctoral Science Foundation, "Smart Grid Self-Awareness based on Power Disturbance Analytics: Theory and Methods", 2015/09 - 2017/08, PI, Grant No. 20150004. First-Class Research Grant, China Postdoctoral Science Foundation, "Stochastic and Stability-Aware Optimal Operation for Power Systems: Model and Algorithm", 2015/07 - 2016/06, PI, Grant No. 2015M570506. Joint Ph.D. Program, China Scholarship Council, "Stability-Constrained Optimal Power Flow for Large-Scale Power Systems", 2012/08 - 2013/11, Grant No. 201206320026. 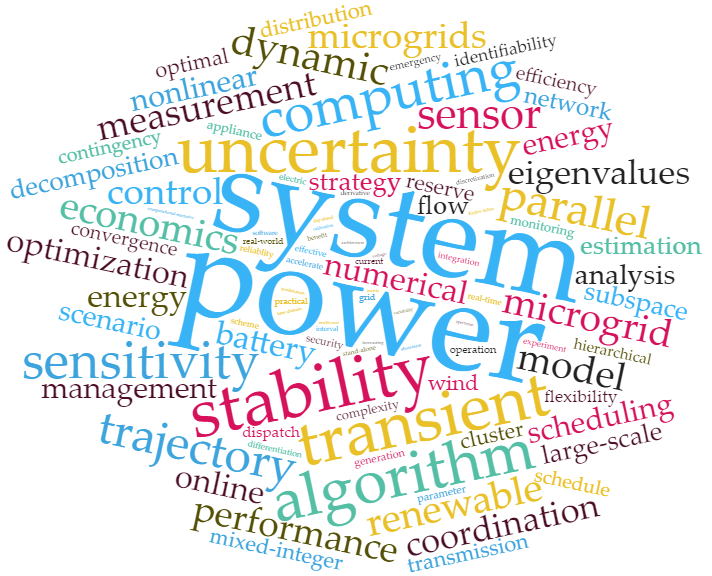 Excellent Doctoral Dissertation Candidate Scholarship, Zhejiang University, "Stability-Constrained Optimal Power Flow for Large-Scale Power Systems: Models, Algorithms and Applications", 2012/04 - 2013/03, Grant No. 201209A.